Heat oven to 375°F. In medium bowl, mix crumbs and melted butter. Press firmly against bottom and side of 9-inch glass pie plate. Bake 6 to 8 minutes or until light brown; cool. Meanwhile, in 2-quart saucepan, stir soymilk, sugar, cornstarch, Key lime peel and Key lime juice with wire whisk until cornstarch is dissolved. Heat over medium heat 5 to 6 minutes, stirring constantly, until mixture is bubbly and thickened; remove from heat. Refrigerate about 30 minutes, stirring occasionally, until cool. Gently stir in 1 cup of the whipped topping; stir in food color. Pour into crust. Spoon or spread remaining whipped topping on top of pie. Refrigerate about 2 hours or until firm. Skip the crust-making step altogether by using a ready-made graham cracker crust. 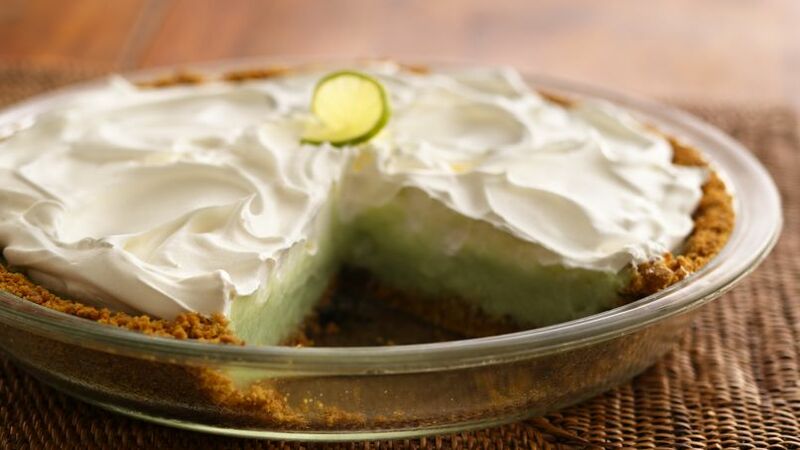 For extra lime flavor, stir 1 teaspoon grated lime peel in with the graham cracker crumbs. A refreshing summertime pie that relies on soymilk for its creamy, smooth filling. 8th Continent is a registered trademark of 8th Continent, LLC, used with permission.